Which Ad-Aware is for you? Undetected malware can not only lead to loss of confidential data, reputation damage and loss of revenue, but also lead to network corruption, drained system resources, and drastically reduced user performance. With the ever-evolving landscape of blended malware and adaptive cyber threats ready to infiltrate enterprise networks, businesses need advanced solutions to reduce the risks of costly attacks. Ad-Aware Business Edition provides powerful, proactive endpoint malware protection, including antivirus, antispyware and antirootkit, with minimal strain on system resources. 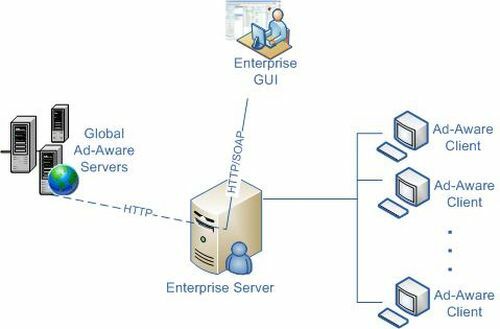 Giving IT administrators control of the network through a flexible and easy to use centralized management tool, this enterprise solution improves efficiency and cuts costs, with easy deployment, simple policy creation, configurable reporting options and much more. Powerful Ad-Aware Pro core engine. Minimize vulnerabilities in the network with a comprehensive defense against blended malware, virus, spyware, keyloggers, Trojans, and more. Advanced anti-rootkit technology and removal system provides deep scans for rootkits, hidden processes, stealth attacks, and other concealed threats. Behavior-based heuristical detection for protection against emerging threats. Real-time process protection – Suspends suspicious files and blocks malicious processes to prevent further system integration. Real-time registry protection – Detects and blocks access to attempted registry changes, a favorite malware target. Real-time network protection – Monitors outgoing network traffic and blocks connections to blacklisted IP addresses and known malicious or hacked websites. Continuous protection with automatic pulse updates. External drive scanning allows clients to scan external storage devices, DVDs, USBs, or any other drives connected to their PCs. Priority online customer support, available by e-mail and live chat. Simplified administration and improved network visibility. Easy to use management tool for greater control, client visibility, and threat overview. Let’s you easily access and control client configuration, updates, policies, scans, and remediation actions. Policy and task management through existing Active Directory setup for simplified control. Optimize time and resources by automating tasks like routine scans, updates, and reporting options. Easily create, view, assign and modify policies, settings and tasks for organizational units, departments, individual stations, remote employees or travelling workers with laptops. Scalable architecture for optimal endpoint malware protection and network security. Simple installment of the server through default settings. Easy configuration & seamless deployment throughout the network, including silent install. Easily secure the entire enterprise network by protecting client workstations, as well as remote workers or employees on the road travelling with corporate laptops. Automatic detection and deployment on new workstations. Minimal performance impact on system resources and on client PC’s. Optimal for businesses that require advanced security without impacting system performance. Optimize resources by setting up download servers to distribute updates through the internal network. Balance the load of large numbers of clients (10,000 +) by easily configuring additional download/application servers. Easily create a customized report for a quick overview of network health. Comprehensive reporting options with on-demand reports for a quick overviews or detailed data (scan logs, threat occurrences, etc.) that can be exported to a single database for further statistics analysis. 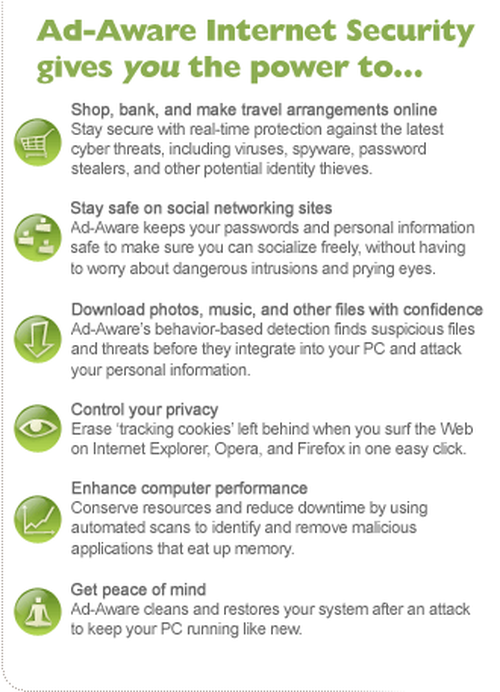 With advanced anti-malware technology, minimal strain on system resources, and powerful protection against viruses, spyware, trojans, worms, rootkits, dialers, and much more, Ad-Aware Pro Internet Security gives you the power to protect your online security and privacy — so that you can use the Internet how, when, and where you want. Ad-Aware actively shields you from the latest cyber threats, including virus, spyware, password stealers, keyloggers, trojans, dialers, and other potential identity thieves. Ad-Aware’s behavior-based detection finds suspicious files and threats before they integrate into your PC and attack your personal information. Erase tracks left behind while surfing the Web, on browsers such as Internet Explorer, Opera, and Firefox, in one easy click. Ad-Aware actively shields you and your business from deceptive applications and cyber attacks. Conserve resources and reduce downtime by using automated scans to identify and remove malicious applications that eat up memory. Ad-Aware cleans and restores your system after an attack to keep your PC running as new. A power-packed combination of our pioneer anti-spyware technology together with traditional anti-virus to provide comprehensive malware protection, including protection against virus, spyware, blended malware, trojans, rootkits, hijackers, keyloggers, and much more. Ad-Watch Live! Expert gives you an additional layer of security by blocking connections to blacklisted IP addresses. It also adds process protection including behavior-based heuristics scanning, registry protection, and real-time network protection. Real-time process protection Blocks or suspends malicious processes and infected files that try to start or connect to your system, to prevent them from further integration in your system. Real-time registry protection Advanced detection of attempted registry changes, a favorite target for many malware distributors. Ad-Watch alerts you when a program tries to make changes to your Registry, giving you the power to block the threat or allow access. Real-time network protection Monitor outgoing network traffic and block connections to blacklisted IP addresses and known malicious websites to identify and stop active threats. Based on heuristics, genotype allows Ad-Aware to stay one step ahead of today's ever-evolving threats, as well as threats that have not yet been created. For in-depth information on this technology, please click here. Expert level rootkit technology to uncover and remove even the most complex monitoring tools, stealth mechanisms and hidden code — preventing the most furtive tactics used to gain unauthorized access to your system. Advanced removal tool combats malware that attempts to restore itself even after rebooting your system. Most people are aware of the dangers and the risk when downloading files from the web. Download Guard provides an additional layer of protection that lets you download files on Internet Explorer confidently. If the file is malicious, you will simply be notified during the download process so that you can take action before any malware can infiltrate your system. Ad-Aware intelligently cleans your system by removing all traces of the infection. Stay protected while watching videos, playing games, or making presentations in full screen mode - without annoying interruptions or strain on system resources that other security software programs cause. Improvements to computer resource usage mean you have protection that won‚t slow your computer down. Lavasoft has developed a range of useful stand-alone applications to help you optimize your computer's performance. ProcessWatch View an in-depth snapshot of all running processes and quickly stop known offenders. ThreatWork Alliance Quickly identify whether suspicious files are safe or malicious - right-click any file or folder to perform an immediate Ad-Aware scan or submit to ThreatWork for analysis. HostsFile Editor An expert tool within Ad-Aware that allows you to take control of your web navigation by adding, deleting or making changes to the Hosts File to create Web navigational shortcuts and to block unsecure and harmful websites. AutoStart Manager Keep your computer running smoothly by taking control over what programs start when your computer does - reducing the toll on your system that occurs when unnecessary programs are running simultaneously. Easily create personalized scan profiles so that Ad-Aware only scans areas that you select. Save time by scanning areas where known malicious programs are located, or choose from 13 different sections to scan, including critical sections, only executables, ZIP files, and the Windows registry. We know not all users have the same needs, so we give you the power to decide how you want to interact with Ad-Aware. NEW! Simple Mode allows you to set and forget - by using our expert recommended settings; no interaction is needed from your part, making using the program as easy as possible. NEW! Advanced Mode lets you customize all the settings as you choose, to tailor everything to your specific needs. Let the experts at Lavasoft guide you. Lavasoft SmartSet makes scanning and cleaning as easy as possible – by providing settings for scans and recommended actions for found infections. Automatic Scans set to your personalized schedule to optimize time and resources. If used in combination with Lavasoft SmartSet, all you have to do is set & forget. Scan network drives so you can detect malware on any shared disks on your network, not just on your hard disk. Scan your external storage device, iPod, USB‚s, or any other drives that you connect to your PC for an additional layer of security. Quickly identify whether a suspicious file is safe or malicious - Right click any file or folder to perform an immediate scan, or send it to ThreatWork Alliance for analysis. Set a Windows system restore point so you can clean-up your system without fear of obstructing your operating system — revert to a previous state in the event of a problem. Control your privacy by erasing tracks left behind while surfing the web on multiple browsers, including Internet Explorer, Firefox, and Opera, with one easy click. Manage your product scans without launching the interface window. Improvements to ThreatWork Alliance allow us to provide the best protection possible against the newest and most relevant threats, through the help of our community of security volunteers. We now give you the power to make Ad-Aware your own. Pick a new look in our Skin Gallery or design your very own skin. You now even have the ability to translate the program and share your language with the world. Please visit MyLavasoft for more information. Ad-Aware now allows developers to expand the functionality of the program by the creation of plug-ins. Get Ad-Aware protection and status notifications through the Windows Security Center. Direct, in-product access to support. Get immediate answers to your questions by easily logging-in to the Lavasoft Support Center for e-mail and live chat support. Protect against the latest forms of malware with faster, continuous pulse updates to guard your privacy against cyber attacks throughout the license duration. Every time you go online to check your email, pay a bill, or download a file, you are exposed to cyber criminals and their relentless attempts to infiltrate your PC to steal your private information. Get complete malware protection against virus, spyware, trojans, rootkits, blended malware, hijackers, keyloggers, and other potential cyber threats with Ad-Aware Plus Internet Security! Download Guard and Ad-Aware's behavior-based detection and scanning finds suspicious files and threats before they integrate into your PC and attack your personal information. Erase tracks left behind while surfing the Web — on browsers such as Internet Explorer, Opera, and Firefox — in one easy click. Block unsecure and harmful websites to protect your children from online predators. Now integrated, Ad-Watch Live! Advanced provides active, real-time registry protection and process protection including behavior-based heuristics scanning. Real-time process protection Ad-Watch suspends suspicious files and blocks malicious processes that try to start or run on your system - to prevent them from further integration in your system - giving you the power to allow or block the process. Real-time registry protection - Advanced detection of attempted registry changes, a favorite target for many malware distributors. Ad-Watch alerts you when a program tries to make changes to your Registry, giving you the power to block or allow access to that program. Deep level rootkit technology that uncovers and destroys hidden threats. Improvements to computer resource usage mean you have protection that won't slow your computer down. Let the experts at Lavasoft guide you. Lavasoft SmartSet makes scanning and cleaning as easy as possible — by providing settings for scans and recommended actions for found infections. Scan your external storage device, iPod, USB's, or any other drives that you connect to your PC for an additional layer of security. The Hosts File Editor is an expert tool within Ad-Aware that allows you to take control of your web navigation by adding, deleting or making changes to the Hosts File to create Web navigational shortcuts and to block unsecure and harmful websites. As cyber threats become increasingly sophisticated, it is more important than ever to have a strong solution to safeguard your online transactions and irreplaceable files. Lavasoft Personal Firewall 3.0 provides the critical protection you need to keep your PC safe from unauthorized access. It is the ultimate security shield against hackers, keyloggers, Trojans and other malicious attempts to access data on your PC, while remaining simple, and easy to use. Get the best performance from your PC! Lavasoft's registry scanner and repair tool increases computer speed and stability by identifying, cleaning, and correcting errors in the Windows registry. Lavasoft Registry Tuner keeps your home or office PC running like new. With prying eyes able to access all kinds of private data through your computer, you need strong solutions to ensure your security. Lavasoft's Privacy Toolbox will help you take full control of your digital information, with both the File Shredder and the Digital Lock in one application. Get the most for your money with savings of over 30 percent compared to buying both products separately! You know you should shred sensitive documents in a paper shredder to protect yourself against data and identity theft. The same is true for data on your PC. Information you erase by formatting your hard drive, or using your computer's "delete" key is still easily recoverable. Lavasoft File Shredder helps you take control of the information you don't want anyone else to get their hands on, by permanently removing the files. Digital Lock's cutting-edge encryption technology allows you to securely store or send files, knowing that your information is safe. Only the correct password can unlock the file. With easy-to-use functions and convenient file selection, Lavasoft Digital Lock is a natural addition to the privacy tools you use regularly to ensure digital security. Strict budgets should not mean reduced security. At Lavasoft, we are well aware that it is sometimes difficult for students, non-profit organizations, and government entities to commit money towards technology upgrades. We strongly believe that everyone has the right to choose privacy and security for their personal information. At half the price, can you afford not to protect your confidential information? Please note: non-profit discounts are only available by directly contacting Worldwide Sales. We are proud to announce the upcoming release of an Ad-Aware version update. Other companies may hold their new security features for the next year's major launch, but not Lavasoft? We're going to give them to our users as we develop them, so they benefit with a boost to their online protection now! NEW! E-mail Scanner - Keeps you safe from malicious attachments and images in your e-mail. NEW! Rootkit Removal System - Deep level rootkit technology that uncovers and destroys hidden threats, detecting both user-mode and kernel-mode attack techniques. AVG takes more than 7 times longer to perform a scan than Ad-Aware. Ad-Aware uses 33% less memory during a scan than Microsoft Security Essentials. Ad-Aware uses 435% less memory in real-time mode than PC Tools Internet Security.